Most of our fans who had pre-orders for the new generation " iPhone 5 " and already got it are seeking now for it's jailbreak. 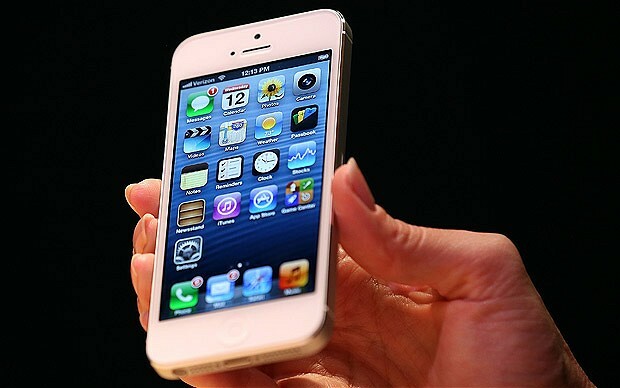 We all looking forward to get iPhone 5 jailbreak. The jailbreak chances have gone scarce since Comex left the jailbreak-Dev team and as always, Apple is supporting their device with very strong security for iOS system which makes it's jailbreak difficult. So we can't give you the status of iPhone 5 jailbreak as p0sixninja described it with " Grim " on something bigger. Let's read more after the jump. 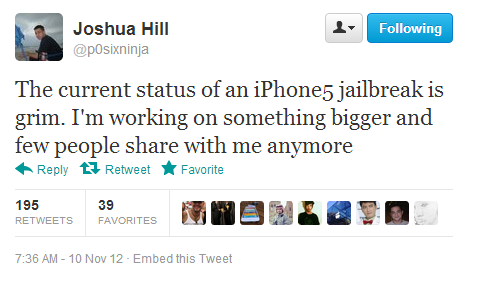 P0sixninja is a notable member of the Jailbreaking team and has been recently working on the iPhone 5 jailbreak but now, he is claiming the chances of a possible iPhone 5 jailbreak as “grim”. Note that it is not the only thing he said and there is also a little good news. We have no leads on what is the “bigger” thing he is working on but we are sure that it will mean nothing but good for the Jailbreaking community. Another thing that he said in his tweet is “…few people share with me anymore.” so that possibly means that very few jailbreak developers share their progress with him so it might be possible that one of the other Dev is working on one.